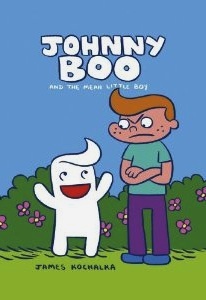 Johnny Boo and the Mean Little Boy is about Johnny Boo and Squiggle. Johnny Boo and Squiggle are ghosties. Squiggle had to make new friends. The mean little boy comes over and thinks the ghost is a butterfly. Johnny Boo finds Squiggle in a jar. My favorite part is when Johnny Boo lets Squiggle out of the jar. I like this book because it's funny and pleasurous. The funny part is when the mean little boy pees in his pants and he changes his pants. I would recommend this book to hilarious kids and funny kids. Editor's note: My Johnny Boo doesn't know it yet, but Johnny Boo Does Something! (Book 5) is coming out in August. I think I'll wait until July to tell him about it – otherwise I'll be hearing "Is it August yet? How about tomorrow?" every day for the next several months.